I arrived Saturday afternoon in Kansas City. The flight from Khrungthep to Los Angeles by way of Taipei was quite comfortable. I have to give an enthusiastic thumbs-up to EVA’s Elite Class (premium economy) which was an excellent value for the money. The space is not nearly so great as in a business class cabin, but is still entirely sufficient that I (at 183cm / 6′ tall) was able to sit with my legs crossed even when the person in the row in front of me was fully reclined. Add to this a solid audio-video on-demand system, attentive and friendly service, and good food, and it is well worth the about US$1200 the ticket cost. Now if they would just fly to a few more US destinations beside Los Angeles, San Francisco, Seattle, and Newark (through Seattle), it would provide a little more flexibility. EVA is in the process of upgrading their 747 fleet with the more updated interior of their 777-300ER fleet. This will be nice because the seats in the 747 definitely were older, while comfortable, and the video system was not on-demand. However, I really like that on their 747, the Elite Class occupies the front part of the plane where First Class is normally located. 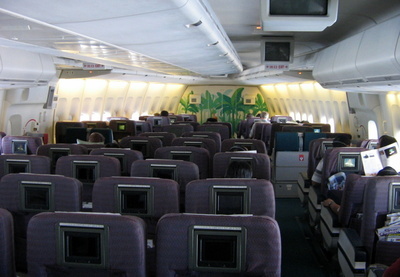 Shown here, the cabin feels particularly spacious for an economy class cabin. After an overnight stop in Los Angeles, where I enjoyed some fish tacos from Rubio’s and a cheeseburger from In-N-Out, I continued to Kansas City aboard a nonstop flight on Midwest Airlines. They feature a 2×2 configuration in their Boeing 717 (updated DC-9) aircraft. This configuration has a business class feel except that the legroom is the same as in regular economy. Really wide seats, really average legroom. But the service is good and the nonstop flight was appreciated. 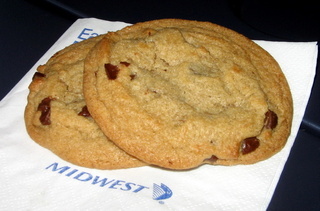 Oh, and their freshly baked chocolate chip cookies were a highlight. I was met at the gate by my sister, Jennifer, and elder niece, Emily. The first day in Kansas City has been a lot of fun, and in between jet lag I’ve had time to do some baking including an apple pie (with assistance from sous chef Emily). Ava, my 18-month-old niece, was shy around me for about the first two minutes and then became my new best friend. She’s already beginning to speak and it is interesting seeing the competition that arises between the girls. Just wait until they are teenagers! Tawn sent me to the condo on Wednesday morning to meet the people from the air conditioner company, who were going to reposition two units. They were supposed to arrive by ten, which means that I was able to sit by the pool for ninety minutes waiting for them to arrive at 11:30. Right: The sliding doors between the living room and the second bedroom / office have been installed. I was shocked to find a dozen people working on the condo, and that was not including the three additional air conditioning guys who showed up. It was a regular frenzy of activity. The cabinets are all being installed and are actually looking the way they are meant to look. The electrician was finalizing wiring and the sliding doors were being installed. 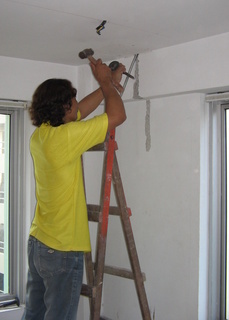 Left: This is how new electrical wiring is installed – just chisel a trench into the concrete wall! Right: It is beginning to really look like a kitchen. We discovered that the height between the counter and the upper cabinets was different on each side of the kitchen, even though the plan specifies the same height of 55 cm. The response when this was pointed out: Mai pben rai! No problem, we’ll just cut off the bottom of one set of cabinets! I feel sorry for the racket that we’re causing for our neighbors. Perhaps it was just because of the amount of activity today, but even with the door closed, I could hear the noise quite clearly down by the pool. Especially the compressor for the nail gun. The lady next to us is a pretty famous Thai supermodel. She recently had some new cabinets delivered to her house and made the delivery men wait by her door while she relaxed by the pool. Tawn saw this happening and quietly pointed her out to the delivery men, who thought that maybe she just wasn’t home yet. After the new cabinet was installed, she has left the old cabinet sitting int he hallway in front of her neighbor’s condo. For two weeks now! Maybe I don’t feel quite so sorry about the construction workers making so much noise. 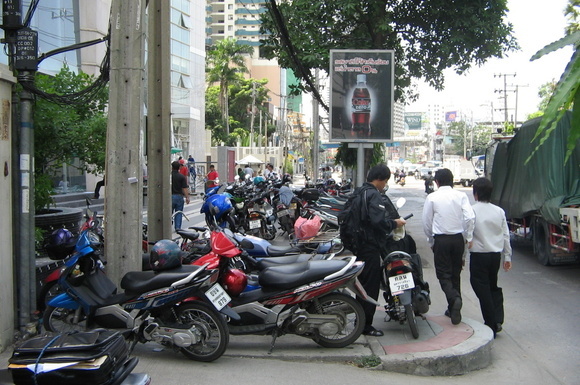 Speaking of not feeling sorry, one of the things that I don’t have any sympathy for is the scads of motorbike messengers who park their scooters on the sidewalks. Shame on the businesses for not providing adequate and convenient parking, since their tenants use these messengers so frequently. But at the same time, shame on the police for not making sure the walking public has the right of way on the sidewalks. Especially noteworthy: the Cotto Tiles building and the adjacent, soon-to-open Millennium Sukhumvit Hotel. Because of the construction going on there, the normal parking lot is closed. So what do the messengers do? Completely block the sidewalk. I leave tomorrow for two weeks – sixteen days, really – in the US. Primary reason for the visit is my cousin Alex’s wedding in Walnut Creek, CA on Saturday the 6th. Also want to spend some time with the family in Kansas City as well as apply for a new visa for Thailand. It already looks like I’ll have to work at least two or three of my vacation days, though, due to a pressing project. 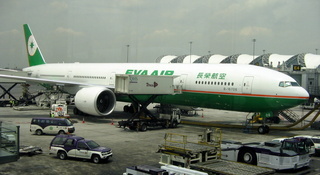 This will be my first time flying EVA Airways, a Taiwanese airline that is part of the Evergreen Group. On the recommendation of Ryan, Vic, and Dave and Monty – all of whom have given positive reviews – I’ll be trying their premium economy class. For about the same price of economy on many airlines (and even a few hundred less than what United was charging), I get a seat that is the equivalent of a domestic US first class seat: 38″ pitch and 18″ width. 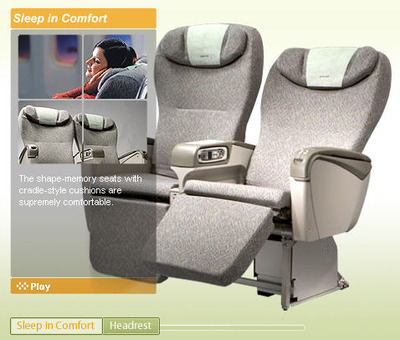 The seats on their new 777-300 have power ports and audio-video on demand in their premium economy seats, too. This is better than United offers even in their business class! Look for a trip report to come from this trip. This is a sign I encountered while riding Sunday morning. The water isn’t from recent rains. 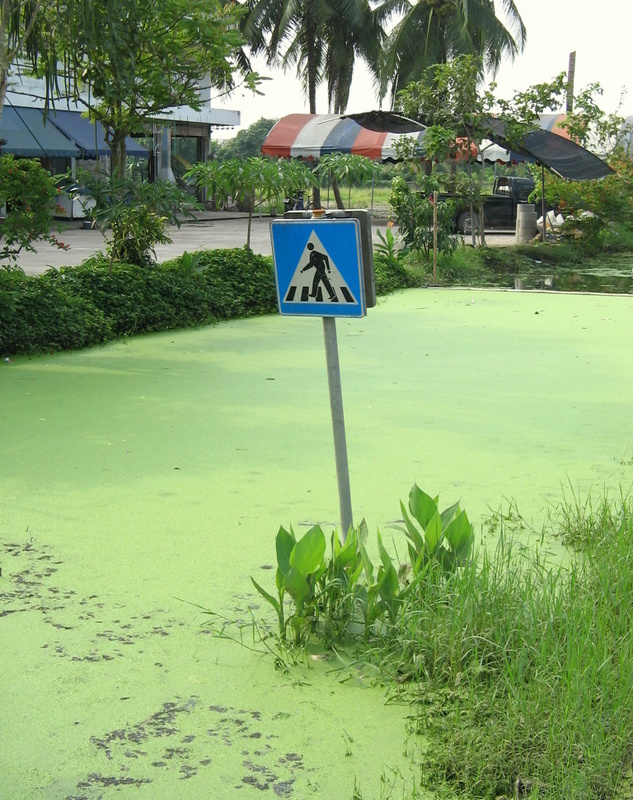 The sign is actually placed in a small khlong that runs alongside the road. What, exactly, is the message here? 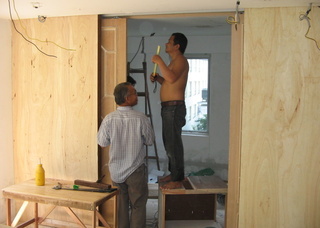 As you can see, the custom made closets are finished and being installed. Work is being done to wedge them into place, shimmy them level, and then finish them as the coat you see in the pictures is just a base coat. There will also be some patterned wallpaper or fabric used in the center frames of the dooors, possible a pattern of bamboo that Tawn saw a sample of. Thankfully, the contractors did at least sand the floors smooth underneath the cabinets, not only making it easier to level them but also ensuring that if the closets are removed in any future remodel, the floors only need to be stained and not sanded as well. The kitchen cabinets are sliding into place, too, although I was a little confused as how they’re going to make the cabinet near the window – the one that’s smack in the center of the picture right now – fit. 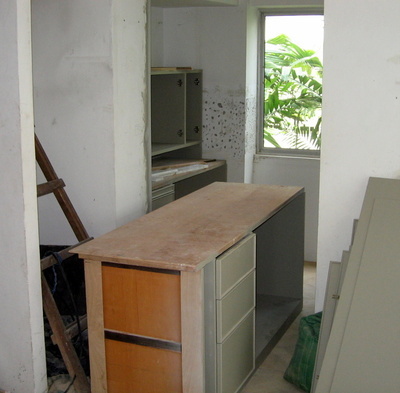 I would have put that piece in second, before the piece on the right-hand side of the kitchen (which you can’t see in this picture) – the one where the stove will go. 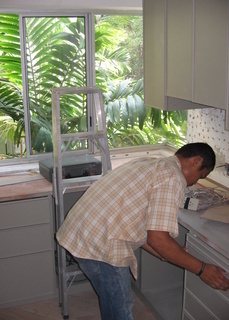 The smaller cabinets you see stacked on the main cabinets (back in the kitchen) are the overhead cabinets. They’ll be mounted in the next few days. As with the bedroom closets, this grey color is the base coat and another coat will be added once everything is installed. So it is grey cabinets, solid black granite, and white ceramic tile backsplash in a lantern pattern that looks vaguely Moroccan or Chinese (to me) or Thai (to Tawn). Playing around with the cabinets, I think they’ll work out very nicely. I’m a little concerned that particle board laminated with plywood is the main construction material for the structural parts of the cabinets, although the fronts of the cabinets are hardwood. I had envisaged all hardwood construction with dove tail joints, which I’m sure could have been had for a hefty number of baht more. Still, the construction quality looks good and once the granite countertops are installed, and sink and stove added, it will look really nice, especially with the hardwood floor. We took a look at the bathroom, too, focusing on the edge of the shower where glass will be installed. We’re trying to achieve a “frame-less” look on the shower and I must confess that my construction knowledge is lacking in this area. They installed marble strips around what essentially is the door jamb for the shower and I’m told they will cut a groove in the marble into which the glass can rest. Which it seems should have been done before the marble was installed, right? But what I really don’t understand is why the marble was placed on top of the tile intsead of being installed in place of it. 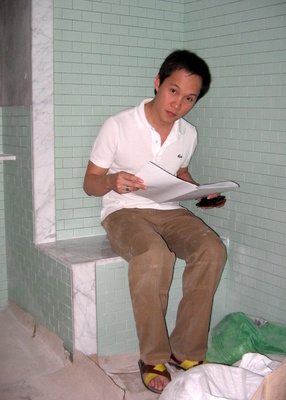 Also to the left of Tawn’s head, that section of marble sticks out from the edge of the wall, as if the installed anticipated that the tiles would be continued up the wall. But that’s not happening. There will be painted walls and a cabinet, instead. So we’ll see how that will work out. I’m sure there is a perfect explanation. It is really nice to see the pieces falling into place. We still have the better part of 6-8 weeks until we should be able to move in, but it will be easier to head out to the US for two weeks knowing that the condo is actually starting to look more like I had envisioned it from the plans. After a month’s absence from the roads, I picked up Markus at 6:00 am Sunday for a bike ride. Instead of just doing lazy circles in the park adjacent to Queen Sirikit Convention Center, we packed up the bicycles and headed east to Minburi, a large and prominently Muslim community north of the new airport. This is where I went on my first bicycle ride in Khrungthep, about two-and-a-half years ago. It was where I learned that you can indeed bicycle in this thriving metropolis. We found a well-located temple to park at and headed off, but not ten minutes into the ride I hit a wet patch of pavement while making a full-speed turn from a main road onto a secondary one. The front tire slide out from under the bike, twisting 180 degrees, and I went flying forward and towards the curb. Thankfully, I did not extend my arm to break my fall or else I’m sure the arm itself would have broken. Instead, I landed on my right shoulder and rolled over. My right knee and elbow were grazed, my right palm has a small bruise as it skidded across the pavement (and that is with gloves on!) and my left wrist is a little tender but has full range of motion. Imagine Alex’s surprise if I showed up at her wedding in a cast in two weeks! I was back up immediately, checked the gears and brakes, and we were off riding fifteen seconds later. The abrasions were not bleeding, so there didn’t seem to be any reason to scrub the ride. And I’m glad we didn’t because we put in a very good 35 kilometers, tracing some routes on back soi and through rice paddies that didn’t appear on my (what I thought was very detailed) map. At one point, we wound up at a small temple at the convergence of three khlongs. Checking my map, the temple was nowhere to be seen. I went inside the temple and kneeling before the head monk, asked him where the temple was located on my map. He studied it carefully, following the contours of the khlongs and finally marked the temple’s location, some half-kilometer away from the nearest road on my map! I was happy to have enough language skill to be able to ask him those questions and understand him. Thanks, Khruu Kitiya! He was also pretty impressed when, after asking him the name of the temple, I wrote it in Thai on my map. If any of you are visiting Thailand and want to really see the country, consider doing some cycling through the countryside. You’ll see a view of the country that cannot be found at tourist sites, in the big cities, or in a tour van. Sunday evening we held the Bon Voyage party for Todd. He’s heading back to Texas on Tuesday morning. It will be a shame for him to leave but I suspect he’ll be back soon. Why is it a good idea to read the newspaper from time to time? So I find out about these types of events. The Thai Film Foundation and the National Film Archive are screening a retrospective of works by pioneering Thai filmmaker Cherd Songsri (left), who essentially introduced Thai culture to world film watchers in the 70s. Born in 1931, Cherd made his first film in 1966. 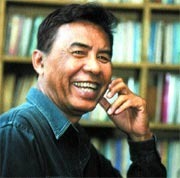 Studying at University of California, Los Angeles in the late 60s energized Cherd to make films that exhibited his concept of “Thainess”. Cherd died in May of last year of cancer. Above: A scene from 1977’s Plae Kao (“The Scar”) starring Nantana Ngaograjang and Sorapong Chantree. Ploy Talay (“The Gem from the Deep” 1987) – Adapted from novelist Mai Muang Derm’s “Sin Nai Naam”, this seaside romantic drama involves a tragic triangular romance and a mysterious gem. 7:00 pm on Monday, 24 September and Friday, 28 September. Am Daeng Muen Kab Nai Rid (“Muen and Rid” 1994), Screened at the 1994 Fukuoka International Film Festival, this drama is based on the true story of a feminist named Am Daeng Muen who lived during the reign of Rama IV and pushed for gender equality. 7:00 pm Tuesday, 25 September and Saturday, 29 September. Plae Kao (“The Scar” 1977) – The classic romantic tragedy of two peasants in rural Thailand. 7:00 pm on Wednesday, 26 September. Tawiphop (“Another World” 1990) is based on the famous novel by Thommayanti about a young Thai woman who steps from the present day world to the era of Rama V, through a magic antique mirror. 7:00 pm on Thursday, 27 September. Puen Paeng (1983) (pictured right) about a triangular love story of two sisters who have the same boyfriend. Shows 7:00 pm Sunday, 30 September. All films show at the EGV Siam Discovery Center. Information at the Thai’>Thai Film Foundation website. A relative of mine says that I live a very interesting life. She claims that if she wrote a blog, she would quickly run out of things about which to write. I have a theory that all of our lives are interesting; it is just a matter of being open to the “blog-able” experiences. Open yourself to them and they will surely come. Take yesterday, for example. All week there had been signs posted throughout the building that on Friday the electricity would be shut down from noon until 1:00 pm so that some maintenance work could be done. I returned home from lunch with Markus (at which we witnessed a man who was installing a plastic sign some six meters off the ground drop a large plexiglass sheet onto the heads of two women dining at a street vendor’s tables below – but that’s another story) and the guard buzzed me into the elevator lobby. The power was still on and I entered an elevator with a young Thai lady who was also waiting. The doors cosed and several seconds after the elevator started ascending – I noticed we had just passed the 20th floor – the power went out and our elevator came to a stop. We stood there in the dark for about a minute, then I used the light from my mobile phone to locate the emergency call button. Almost immediately a lady asked me in Thai where we were, and I guessed that we were around the 21st or 22nd floor. She said something to the effect of, “sit tight” and so we did. About four minutes later, as the car was beginning to get a bit warm, the power came back on. We didn’t move for another minute or so, and the buttons were unresponsive. Then the floor numbers lit up again and we started climbing, passing my floor and continuing up to the lady’s requested 37th floor. I decided that for the sake of safety, I had best alight at the 37th floor and take the stairs back down to our 25th floor. This worked out okay, although the power was cut off again somewhere around the 29th floor, but the emergency lights came on just two seconds later. So that was my exciting Friday.